Long before Jack, Rose and the Heart of the Ocean sailed into movie legend, I was a bona fide “Titaniac.” Planning my second visit to Ireland, I wanted to do more than kiss the Blarney Stone again and visit ancient ruins. I was determined to check out Queenstown, the fabled ship’s last port of call. With no sign of Queenstown on my Irish map, research showed it is now known as Cobh (pronounced “cove”). Cobh is located on the south shore of the Great Island in Cork Harbour (one of the largest natural harbors in the world). This sleepy town with its building facades sporting traditional Irish pastel colors of blue, yellow, pink and green sits on south-facing slopes overlooking the entrance to the harbor. St. Coleman’s Cathedral, the town’s most distinguishable landmark, crowns the top of the slopes, its 300-foot spire piercing the brilliant sky. Early in Irish history, the island was known by several different names that roll off the tongue like the words of a lilting Celtic ballad: Oilean Ard Neimheadh, Crich Liathain and Oilean Mor An Barra. The village on the island was known as Ballyvoloon. In 1750 it was first referred to as Cove village. To commemorate a visit by Queen Victoria in 1849, the town’s name was changed to Queenstown and it retained that moniker until the creation of the Irish Free State in 1922 when the more Gaelic-sounding spelling of “Cobh” was adopted. On April 11, 1912, there were 123 Irish immigrants lining the tiny White Star Line pier on Scott’s Quay in Cobh. Each one clutched a ticket for passage on the largest ocean liner in the world and harbored a personal dream of a more prosperous life in America. As they boarded the tenders PS Ireland and PS America berthed at the quay, the small group became literally the last people to leave solid land to board the great ship, earning them a place in nautical immortality. Only 44 of them would survive the tragic sinking a mere three days later. 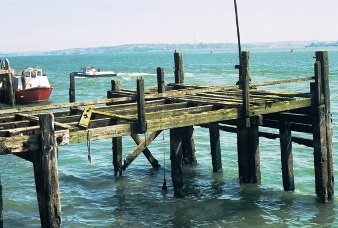 The dilapidated remains of that pier still stand today next to the quay. The old White Star building is there, too, even though its interior has burned twice in the past decade. Across the street, in Pearse Square, a memorial pays tribute to those lost on the Titanic. The bronze relief on the monument depicts passengers being ferried out to the ship plus an image of a lady with a brood of children. She is Margaret Rice, a 39-year-old widow, who was heading to Spokane, Washington with her five sons, aged 2-10. They did not survive the sinking. The deaths of Ms. Rice and her children are notably the largest single family loss of all of the Irish families aboard the “unsinkable” ship. These sites, plus 16 others relating to Cobh and the Titanic, are part of The Titanic Trail, a guided walking tour led by local historian Michael Martin. Cost is only 9.5 Euros and tours are held daily year round. Immersed in the mosaic of Irish history, Cobh is the real jewel in the Titanic saga, offering a rich tapestry of discovery, adventure and beauty. I was relieved merchants had resisted the temptation to cash in on its Titanic link. Missing are the shops full of Titanic kitsch and caboodle and instead I found a charming village where visitors can soak up the local warm hospitality and hearty Irish fare. Additional interesting attractions can be found in Cobh such as The Queenstown Story dealing with Irish immigration (2.5 million immigrants left from this “Gateway to the New World”), the 750-acre Fota Island (a nearby wildlife preserve), and historic ties to another maritime disaster, the Lusitania. For more information about The Titanic Trail, including hours, minibus tour details and directions, go to www.titanic-trail.com.